I've been thinking about what sorts of careers are right for me. I like research, and I want to keep doing it. 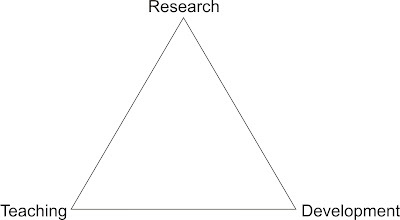 But it turns out, in this complicated world, there are a many definitions of what research actually means and, therefore, a variety of things I could be doing. I recently took this to an extreme in a previous lighthearted blog post. Instead, in this post, I want to explore the space of conventional research careers. There are lots of resources online to help make the decision, like this one from MIT. Here is my take. As a scientist, I work on theories (and theory) and do experiments. As a scholar, I study previous work by looking at records (books, publications, journals...), collecting a lot of (perhaps obscure) knowledge. And finally, as a technologist, I enjoy the latest gadgets and their impact on society, and I do tinker once in a while. There is a rough mapping between scientist -> research, from scholar -> teaching and from technologist -> development, but its a little more complicated than that. In fact, each of the three career nodal points require a bit of each `hat'. The sad thing about the career space is that compromise is inevitable. If you love to teach, and you want to go to either a high-school or a liberal arts college, you'll eventually have to reduce the amount of time you spend doing research or hacking (or do those things in your free time, which would affect your work-life balance). Same holds for a development position at, say, a software company. From my experience, most positions tend to pick only two of the above career foci. For example, industrial research positions have no teaching, and so they've picked research and development. All industrial labs fall in a spectrum of R&D. Now granted, there are interns, but its a limited form of the third vertex. Similarly a professorship position is both research and teaching (and writing grants, but lets leave out stuff we hate). You do get the odd prof who hacks apps and creates good infrastructure code, but its pretty rare. The bottom line: conventional post PhD careers involve severe compromise on at least one of the types of things grad students might enjoy. You can always include the thing you compromised on, but it might eat up into your work-life balance, since its not something you are evaluated on, at your workplace. Most websites that deal with this topic tend to be "pro" or "con" even though they claim to be "neutral".